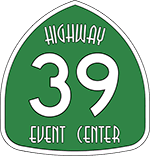 Highway 39 Event Center is located in the Platinum Triangle district of Anaheim with easy access to four major freeways. We are 12-miles from John Wayne Airport and there are several dozen hotels in the immediate area. We are conveniently close, and only a few blocks away from the Anaheim Convention Center and Disneyland. Parking: FREE! Easy access for buses, limos, 18-wheelers. Valet service available.